How to develop rich web apps using Spring web MVB and the ZK UI framework with a useful demo. The figure below depicts the Ajax update workflow for ZK and Spring MVC. The left panel is the same as the ZK architecture workflow, which handles everything concerning client side updates, and the right panel is similar to the Spring MVC architecture workflow. We have designated the white area (circle) as a ZK Spring MVC extension, representing the possibilities of using ZK and Spring MVC together. As you can see from above, step 6a is the normal Spring MVC method to handle the response data, and we have injected ZK lifecycle to 6b to allow developers to manipulate ZK components there. The following demonstrates leveraging Spring MVC controller with ZK UI components to develop a To-do management system with CRUD operations in Java code. We provided a few new annotations for developer to use. The controller we used is a Spring MVC controller and we have declared some @RequestMapping to handle the request with ZK components. return ZKModelAndView.SELF; // meaning the view is handled by ZK way. In this demo we have chosen a Zul page with the built-in ZK components, and specified the namespace declaration within line 1 in the list.zul file. Q: Can we use ZK MVVM with Spring MVC approach? A: Yes, it is possible with this version. Q: Can we use ZK MVVM validator mechanism with Spring MVC approach? A: Yes, it is possible with this version. Q: Can we use HTML or XHTML as a view with ZK SpringMVC approach? A: Yes, ZK 8 version allows you to do this. 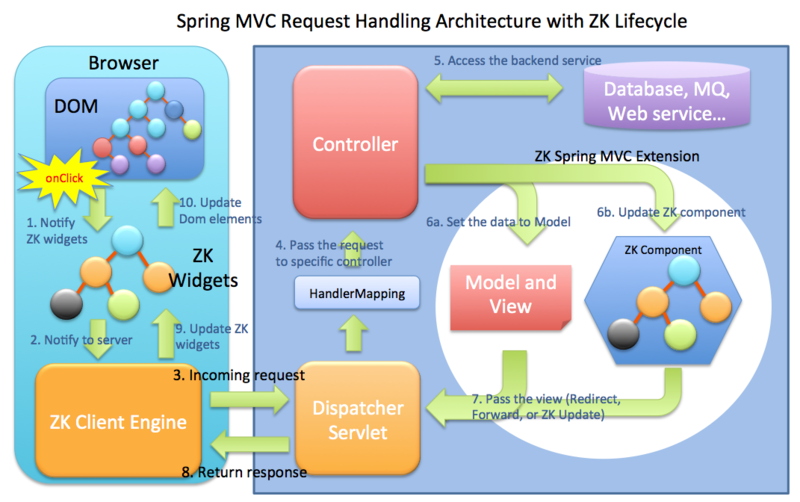 Q: Can we use Spring MVC controller with ZK composer or ZK MVVM ViewModel mechanism together? A: Yes, it is possible. You can use Spring MVC controller to update the big area, and inside the big area, you can still use ZK Composer or ZK MVVM ViewModel to control the micro update. Q: Where’s the use of Form Submit to get data in ZK SpringMVC approach? A: In the ZK world, you don’t need to use Form Submit to receive data on the server side, as you can get all the data from ZK component directly on the server. The whole demo project can be found at Github.